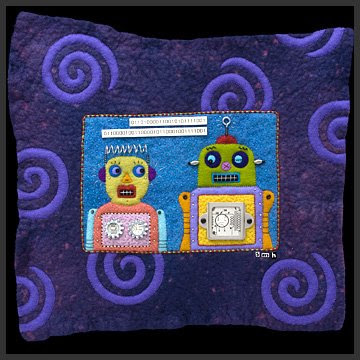 Referencing yesterdays post about Susan's robot piece, Cindy from Art Making in the North left a comment with a link to Fobot Found Object Robots by artist and creator Amy Flynn. I love these! Amy makes these fantastic sculptures from vintage tins, toys and hardware, each one is unique with so much personality. 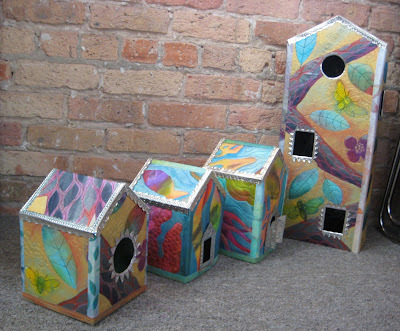 Amy also has a blog so you can keep up with her latest creations and see where she is exhibiting. 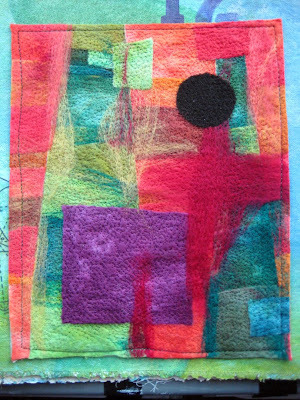 Cool Mixed Media Felt art by Susan Hinckley. I have mentioned Susan's work before, but if you haven't gone over to check out Susan's entertaining blog filled with great vintage advertising images that reflect her humor and outlook on life yet, you really should. 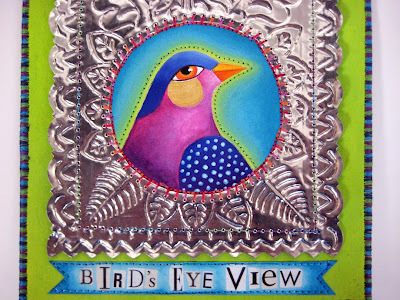 Visit her website too, it features lots of her beautiful work. We drove up to Asheville again on the weekend. I had to get in a few of the requisite stops suggested to me, I wish I had time to see them all and sample more of the fabulous restaurants. 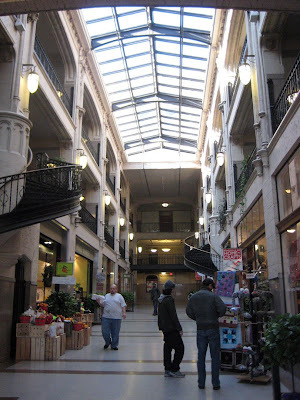 In downtown Asheville there is a beautiful historic building with restaurants and artisan shops called The Grove Arcade. Down the street we went into a wonderful craft supply store called Earth Guild, there was an excellent selection of textile paints and dyes, looms, leather working tools, etc. Next door we went into a fun clothing store with lots of things I would love to buy. 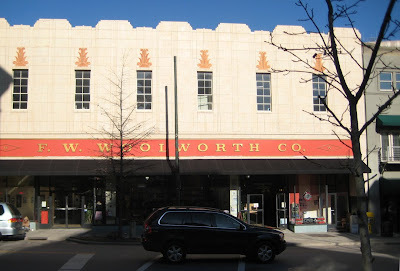 A little further down the sidewalk is Woolworth Walk, a renovated Woolworth's store, now home to 150 exhibiting artists and artisans making and selling jewelery, fine art, decorative art and crafts. 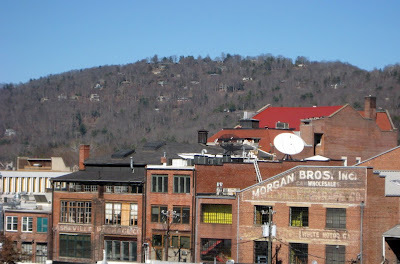 All around Asheville there is a lovely backdrop of mountains surrounding buildings from the 1920's and 30's. It is a very picturesque town with such friendly people, we felt so welcome there. The drive east going back down the mountain. 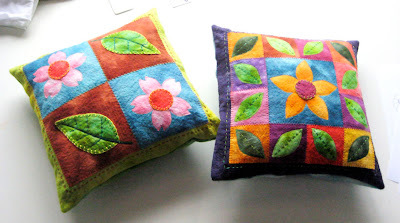 I made these pillows from cotton batting for RIT to use in their booth at the CHA conference in Anaheim, CA. Thanks for the pictures Jamie. There's my quilt that was used in Quilting Arts TV episode 312 and for my article in the December 2008 issue of Quilting Arts magazine. I also had a few things displayed in the Walnut Hollow booth. 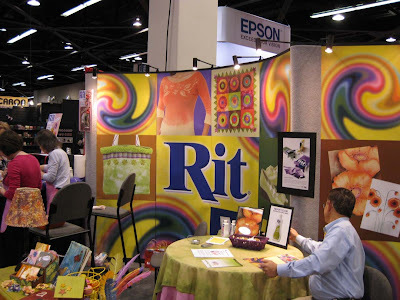 The CHA show looks like such an interesting convention, just imagine a whole convention filled with manufacturers of crafting products. 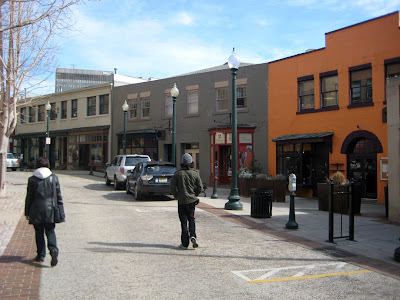 I have been checking out the sites of Western North Carolina for the last week, staying in Winston Salem and taking day trips to Charlotte, Greensboro and Asheville. Works entered should in some way incorporate photography. Mixed-media is strongly encouraged, though any artistic medium may be entered (photographs, painting, collage, mixed media, sculpture, etc.) 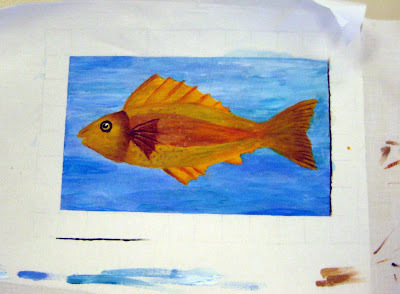 as long as the finished artwork incorporates at least one photograph or photographic image. 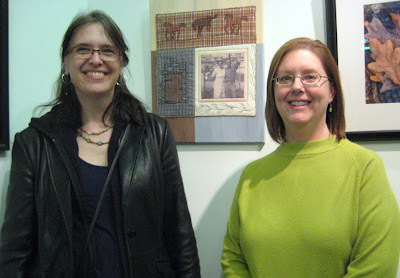 There was a lot of really nice work including a few textile pieces and I had the pleasure to meet blogger friend Karen Newman Fridy who lives in the Winston Salem area and had two pieces in the show. 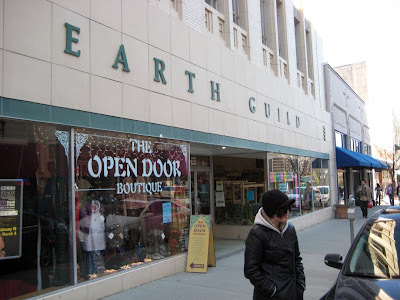 The first day I was in Winston Salem and walked around the corner of the gallery and recognized Karen's vessel in the window. I sent her an email and Karen told me about the opening. 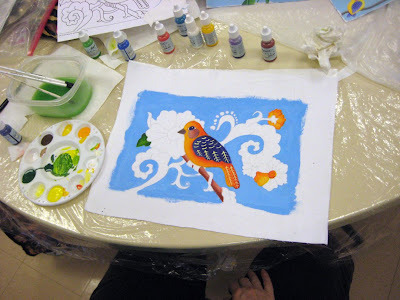 I love blogs, they are such a wonderful way for us to meet friends from all over the world. 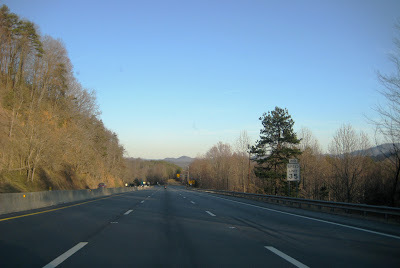 On Tuesday, my kids and I drove up to Asheville, it is about 2 1/2 hours west of Winston-Salem. We parked downtown and the first store we saw outside of the parking garage was a wonderful bead shop, Beads and Beyond my daughter immediately had a few purchases to make. 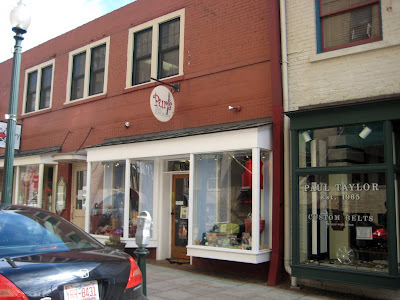 I have always heard such great things about Asheville and was so excited to finally have the opportunity to visit. When I saw the yarn shop right down the street I new this city was a great place to be. 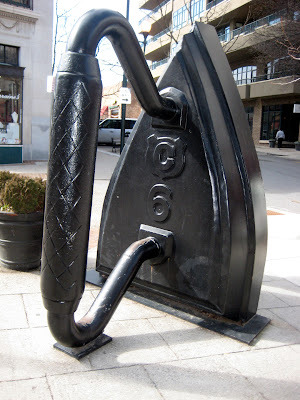 How cool is this sculpture a little further down the street for all of us textile lovers. North Carolina was a huge textile industry state, sadly most of our fabric is now made overseas. Don't you think the Chicago School of Fusing needs to have one of these on their campus? Such a fun place with a lot to explore and so beautiful. I can only imagine how breathtaking it must be in spring and fall. Hopefully I'll have the opportunity to see what that is like one day. 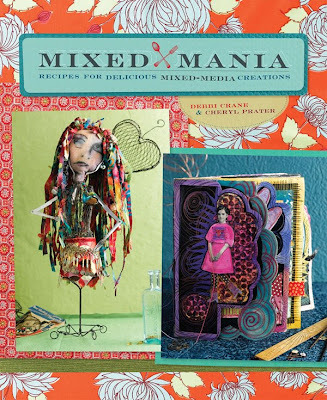 A year and a half ago Cheryl Prater and Debbi Crane asked my sister Deb and I to make a mixed media apron for the book they were writing, Mixed Mania. Since Deb lives in Maine and I live in Chicago, I started the apron and then mailed it to her for embellishing and finishing. 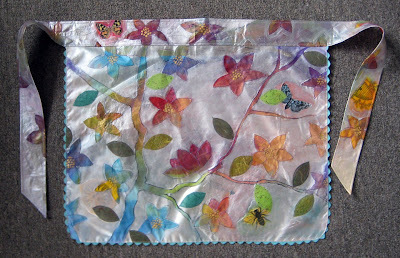 I was not sure what I was going to do, I just knew it needed to incorporate paper and fabric, so I pulled out the gel medium some images printed on paper, a sewing pattern, a phone book page and tore them up and glued them to some white fabric with the gel medium. 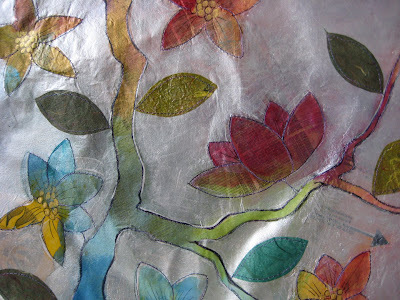 I painted the fabric and paper images with textile paint then grabbed a sharpie marker and drew some branches and flowers. I took out the white pearl Lumiere paint and painted around the flowers and branches and added a few more details with a black pen. 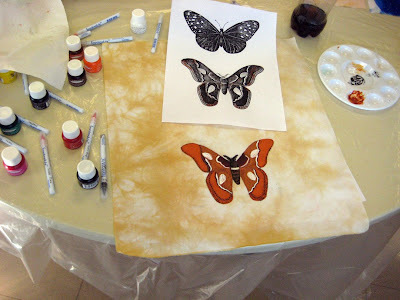 I cut some paper leaves and used gel medium to glue them to the painted fabric. 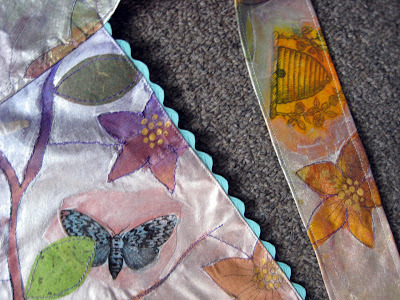 I stitched around the flowers, leaves and branches then sewed the fabric into an apron shape adding blue rick rack trim. Then I mailed it to my sister. 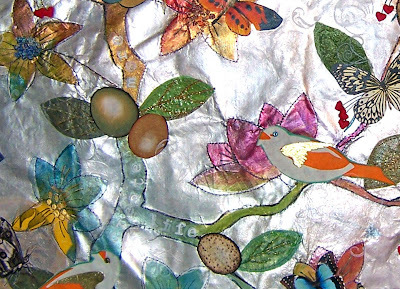 Deb added birds cut from fabric, paper butterflies and eggs, french knots on the flowers, stitched details on the leaves and white on white swirling stamped designs. It was a really fun project to do, and it was the inspiration for the technique I have used in many other projects like these. 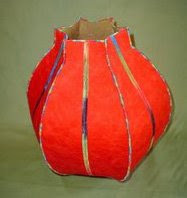 I had so much fun making I Beelieve for Virgina Spiegel's Fiber art for a Cause that I had to make another one. I wish things weren't so busy right now, I suppose that is not about to change any time soon, because I would love to make a bunch more. 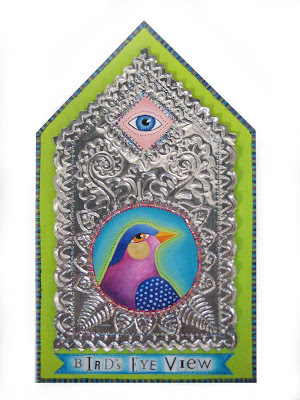 I really like the combination of hard metal with soft fabric and I have always loved religious icon paintings that have the metal work over them with the little glimpses of painted surface. I have drooled over the Kindle ever since I first learned about it. I read every review and description of this piece of technology and was convinced I needed one. At the time it was impossible to get one because they sold out so fast. With time to think about it, I decided like all new devices there would be bugs in the system or things to improve upon, so I decided to wait for Kindle 2. For a year, I have Googled for updates trying to find out when it would be released but never found any thing to tell me how long I would have to wait. Now it is finally here, the pre-orders can be made and it looks like there are some great improvements! It is set to ship on February 24th on a first come basis. I think this might be one of those things I will consider my own personal stimulus package and contribution to the economy. 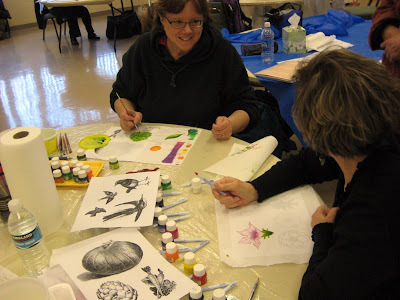 This week I gave a lecture and taught two workshops for the North Suburban Needle Arts Guild. 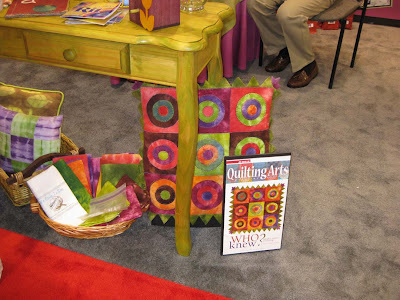 What a great guild, there are quilters, doll makers, beaders, knitters, etc., basically all kinds fiber artists. 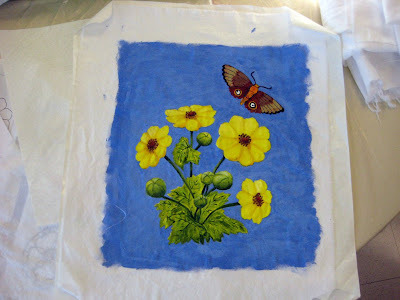 I taught Painting Fabric for Whole Cloth Quilts the first day and using Tsukineko Inks the second day. 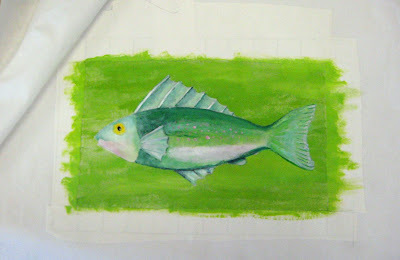 Because I consider these technique classes where I am teaching people how to use these mediums I do not want them to stress out about coming up with an image or needing to be creative, they can do that after they have learned the techniques, so I provide images that I have drawn for students to work from. 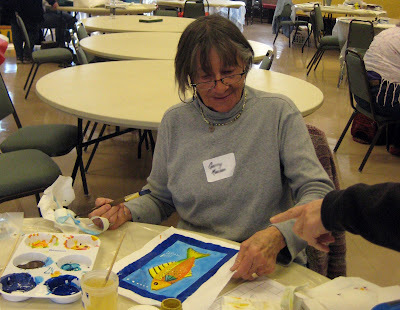 I love seeing the different ways people paint the images. 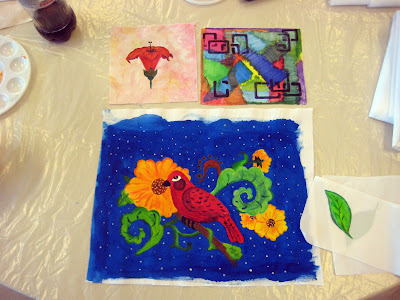 There were so many beautiful paintings, I wish we had time to take these through being quilted too. I would love to see the stitching bring out the details. For the Tsukineko inks class I have students work from old copyright free engravings of flowers, vegetables, birds and insects. I like using these images because the lights and darks are very clear, helping with the shading. 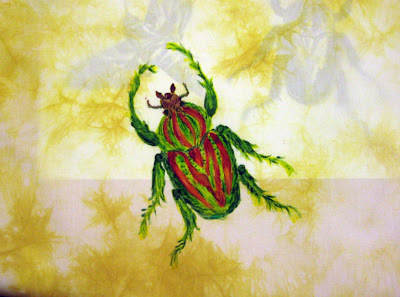 I teach two different techniques for applying the inks and I have students begin the class working on white fabric and then progress to more complex images on light hand dyed fabric (dyed with RIT in the microwave). Such a fun group, we covered a lot of techniques, everyone was relaxed and did wonderful work. 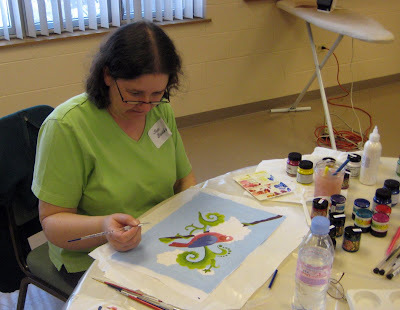 I will be teaching these same two classes in April at the International Quilt Festival in Chicago, if you are interested in learning these techniques I would love to have you in my classes. I spent the weekend with some friends and one of them had a needle felting machine. I have never worked with one before but I knew the Rit dyed batting I brought was going to be perfect. I cut 9 squares and 9 circles from warm and cool colors and layered them alternating warm circles on cool squares and cool circles on warm squares on top of a piece of buckram. 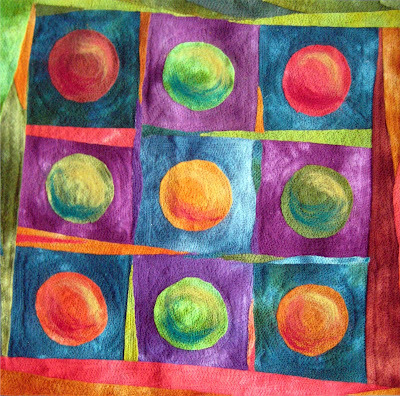 I filled in little gaps with strips of different colors and added roving to the circles for highlights and shadows. It was SOOOO much fun. I love the painterly quality. I had to keep playing and made another simple composition. Now I see why people want a needle felting machine after they try one out. I do not think I need to add one to my collection of tools just yet, but I would love to work on one again sometime. 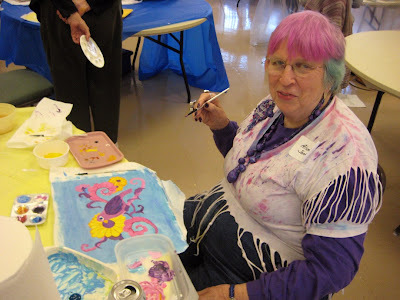 In the morning I head off to do a lecture at the North Suburban Needle Arts Guild, north of Chicago. 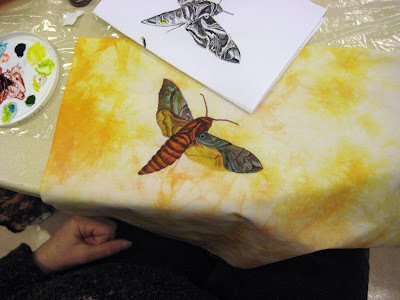 On Wednesday and Thursday I am also teaching two workshops for the guild; painting fabric for whole cloth quilts and using Tsukineko inks.